We writers are gifted with turning a phrase, but with that power comes great responsibility. 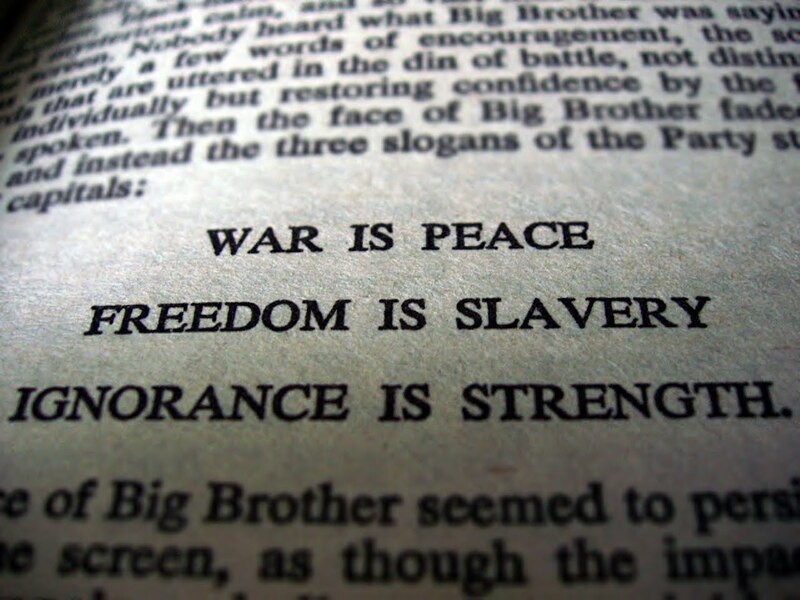 I, like most high school students in the US, read the novel 1984 by George Orwell (part of an ingenious triple play by my English teacher, who concurrently assigned Brave New World and The Handmaids Tail for a post-apocalyptic triptych) as part of my senior English class. Although the year 1984 had passed by the time Orwell’s grim vision of the future hit my desk, I remember feeling a vague foreboding – we were not out of the woods yet. This malaise only grew when I completed my teacher’s final assignment: write one of the missing chapters of Winston’s “book”. I remember choosing “War is Peace.” I remember that I got an A+ on the assignment. Makes me wonder if my teacher detected some latent talent. Later, while trapped in the Orwellian nightmare that is law school, I realized a talent for doublespeak can come in handy – particularly when you’re tasked with playing devil’s advocate. I used the well-worn phrase, “the pen is mightier than the sword,” in a recent post about putting drama on the page. But as many of you know, those words are actually associated with political speech, covering both dissent and persuasion. We are writers, and that means we are gifted with turning a phrase, finding the right adjective or adverb for the right situation, and using our creative muscle to draft a compelling scene, invoke a powerful emotion, and change an opinion. As always, with that power comes great responsibility. At least that’s what I believe – and that belief comes, in part, from my own experiences with doublespeak: in law school, in the workplace, and in the media. How many times have you heard or read something you believed it to be true, only to stumble upon a different version making you question your first impression? It happens all the time, and when the truth is obscured, we all lose. In Writeful, Gary Hoffman warns against this type of writing, which he calls “Making Faces.” According to Hoffman, we should never fall into the trap of writing insincerely or using language as a form of intimidation. Not only can the results be dishonest and the intent questionable, the final product is often not very good. “Aside from usually being immoral or unethical, this inflation and deception is sure to bore at best, and embarrass at worst,” says Hoffman. Sometimes writers add layers of prose in order to avoid giving the straight truth. Are you guilty of Face-packing? The best way to find out is to try it yourself. Hoffman suggests an exercise that involves taking something simple and making it complicated. For example, in the exercise below I picked declining an invitation to a party. Following Hoffman’s instruction, I broke it, down into a step-by-step process, and then came up with five, never-before-used, euphemism to summarize all those steps. After completing the exercise, I saw how I sometimes add layers in order to avoid giving the straight truth. For me, it’s hard to say “no” to people…I don’t want to hurt anybody’s feelings. Maybe now, I’ll just use one of my handy new euphemisms! After completing the exercise, I saw how I sometimes add layers in order to avoid giving the straight truth. For me, it’s hard to say “no” to people…I don’t want to hurt anybody’s feelings. Maybe now, I’ll just use one of my handy new euphemisms! You receive an invitation to an event you do not want to attend. On the invitation are details about the event – time, place, type – and instructions on how to RSVP. After noting the particulars of the event and determining that you do not want to attend, you must contact the host and explain that you will not be there. At the time of that conversation, you may be called upon to expand on your explanation and give specific reasons as to why you are not attending the event. The conversation ends when the host understands that you will not be attending. 2) Clearing out space for other guests. 3) Making sure there’s enough cake to go around. The downside of war paint writing is that it intimidates the reader while also allowing the writer to exaggerate the importance of their topic. When it comes to War Paint, Hoffman’s second making faces category, you begin to wade into the territory of professional and technical writing. While it is sometimes necessary to use terms of art familiar to the industry you’re writing for work, according to Hoffman, the downside of war paint writing is that it intimidates the reader while also allowing the writer to exaggerate the importance of their topic. In Hoffman’s second exercise, you’re asked to take some simple, well-worn phrases and complicate the heck out of them. Work Out Exercise 2: Simple phrases made complicated. 1) Simple: It is what it is. Complicated: That which may or may not exist in a realm that may or may not be perceivable to the naked eye or some other such sense as is the most adequate to perceive a person, place, thing or situation (i.e., eyes may see, ears may hear, and a hand may feel that something is or is not there) can ultimately be defined by its essential nature. 2) Curiosity killed the cat. Wondering, questioning and generally searching for answers ultimately results in the subsequent demise of the unfortunate feline that initiated the inquiry. 3) A bird in the hand is worth two in the bush. When it comes to valuing the relative value of an avian entity, the general assumption is that a feathered creature that is currently clutched within the grip of its assumptive owner can be assessed at a higher value than double the number of similar animals that have not, in fact, been equally incarcerated. The Metal Mask is a code for complex problems so makes the discussion of problems simpler and quicker, but sometimes metal mask can unintentionally hide reality. Finally, we’ve hit the most notorious face-making writing of all: the metal mask. Virtually interchangeable with Orwell’s doublespeak, the metal mask uses jargon, labels, and buzzwords to obscure what is actually really being said. And after surviving law school, I have a particular aversion to this type of writing, even as I am forced to acknowledge that I have a special aptitude for it. But forearmed is forewarned as far as I’m concerned! In Hoffman’s final exercise, you’re asked to take a simple task and break it down with jargon, warnings, and complex sub-steps until it is almost meaningless. Below is my attempt – would love to hear what you think. The act of gathering a multitude of garments – many of which are most likely teeming with a variety of bacteria in addition to stains, smells and other signs of wear – in order to cleanse the fabrics of those garments, is a multistep process that can be both complicated and time consuming. It must be noted that failure to precisely follow these directions could result in damage to the clothes being washed, as well as possible malfunction of equipment which could lead to a pipe burst (and resultant flooding and water damage) or electrical fire (which could ignite not just the structure where the device is kept, but could in fact spread, endangering entire neighborhoods and fragile habitats). Please follow the directions below in order to insure that your clothes washing proceeds without misstep or injury. The first step for laundering clothes involves a separation of garments. Two to five piles of clothes will most likely result from this weeding action; depending on the types of fabrics you wear and the predominance of colors in your wardrobe. First, divide you jackets, shirts, pants, dresses and undergarments into two piles – “light” and dark.” Light garments will tend to fall towards the light (white) end of the color spectrum while darker colors will fall nearer to black. From within those piles, separate further until you have created groups of clothing that are consistently hued. Once you have placed the clothes and detergent into the washer and followed the manual directions for the wash settings, hit the “power” button and begin the process. Make sure to monitor the machine as it runs through the washing cycle in order to insure that the machine is running appropriately and so that you can promptly remove your clothing once the wash cycle is done.